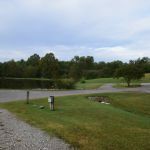 Ask fellow campers about "Natchez Trace RV Park" and nearby attractions. Overnighted here. IMO, this park is NOT big rig friendly. Yes, you can get around, but you have to watch out for tree limbs and such. Sites are VERY close. Gravel driveway needs box bladed. Had a gully cut thru close to the entrance. Park is quiet. Not fenced dog run. Some trees, so satellite may be a challenge. Easy drive to Tupelo for supplies. We camped at Natchez Trace RV Park in a Fifth Wheel. This is a very small park, a short distance from the Natchez Trace Parkway, and about 10 miles from Tupelo. The grounds are nice and very well kept. The owners are extremely friendly, as were all the other campers staying while we were there. As other reviewers have stated, the interior roads are narrow in some areas, but we never had any issues with our 44 foot rig. There are trees in some parts of the park, but we were able to get a good satellite signal with our rooftop dish, even though we were parked under some trees. We never had any problems with the power or water either. We chose not to use their sewer hookup because we were only staying there for two days, and we decided to situate our rig to insure a good satellite signal instead. We did use their dump site as we exited the park. We enjoyed the quiet of the park, the clean grounds, and the friendly atmosphere during our stay. If we return to the area, we will definitely stay here again. We camped at Natchez Trace RV Park in a Motorhome. Small park just off the Trace outside Tupelo about 10 miles. Sites are close together and not very level. Getting sewer and 50 amp power is iffy because only a few of them. Stayed six nights; first few with no sewer and two wheels of rig off the ground. Moved to site with sewer, but door side of rig was on downhill side so step was high off ground. Park is old but well kept. Lots of grass with two moss filled ponds with water birds. We camped at Natchez Trace RV Park in a Fifth Wheel. Natchez Trace, at least in this area will accommodate big rigs. Saw only two overpasses near Jackson and they may be tall enough. Best to ask if there is a question about height. Many local roads go under the Trace and DO NOT have adequate clearance for big rigs. This state park is located on a large lake about 10 miles west of Tupelo with two camping areas set on adjacent points of land. The larger lake was dry, looks as though it has been for a while. Site spacing is good, level and paved. Due to its remote location, the park is quiet at night. Fifteen over the air TV stations were available but because of trees the roof satellite would not work. AT&T wireless signals had 3 bars of LTE with download speeds of 8 Mbps and uploads of 1.12 Mbps. Roads into and inside the park are extremely rough. We camped at Natchez Trace RV Park in a Motorhome. My DH and I stayed in this Park for a few days while visiting Tupelo. Our site was roomy but other sites may be close. There's a small pool which we enjoyed. Our dog enjoyed the nature walk (make sure you spray up for mosquitos and ticks). There's no bath house but in the office, there's a bathroom with a shower. No cable or wifi. While we were there, there were thunderstorms so our Verizon service was sketchy. The owners are very nice and we very much enjoyed our time there. We camped at Natchez Trace RV Park in a Motorhome. No WiFi service, dumpster is far away walk from campground. Site not level and close together and narrow. Was convenient to Tupelo. Decent Verizon service. We stayed two nights. There isn't a whole lot of choices in the area. Someone left the laundry room door open and it was full of bugs. Not sure if we would stay again. We camped at Natchez Trace RV Park in a Motorhome. Park is in Shannon Mississippi near Tupelo. It was late in the day arriving due to heavy rain. Park is clean and tidy. Thankful for a RV Garmin to find this park. Some sites are a bit tight, ours was not. We had plenty of room for our Tow Car. $28.00 was for 2 persons. Extra Charge of $2.00 per person. Our total was $32.00. Owner makes it clear DO NOT DRIVE on his GRASS. We camped at Natchez Trace RV Park in a Motorhome. Tupelo is less than 10 miles. There is also a gas & convenience store nearby. About 3 mile. It was open late thankfully. Didn't have enough limestone for our site, had to walk through dirt to get in RV. No Wi-Fi service, dumpster a good walk from campground. Site wasn't level. Was convenient to Natchez Trace and thus to Tupelo. Decent AT&T service. Friendly staff. We stayed two nights, first was at Good Sam rate and second was at Passport America rate. I didn't quite understand the reason for the difference. Cost above is the average We camped at Natchez Trace RV Park in a Motorhome. This park is quite a ways from I-22. The entrance to the park is very confusing. If you are traveling in a motorhome towing a car, be advised to stop as soon as you get the car off of the road. Be prepared to make a right as soon as you turn or you will miss the correct way to get to the campsites and have to go all the way around the park and come back out on the road. There is no where to turn around in the park and you cannot back up when you are towing a car. Interior roads are full of potholes. Check in was efficient and friendly and this was New Years Day. Long pull through site. Disappointed in this park based on previous reviews. We camped at Natchez Trace RV Park in a Motorhome. Did not go anywhere as this was just an overnight stop. After a day's ride up the Trace, this was a nice find. The campground is located only a few feet off the trace w/o any road noise. Tupelo is very close if you care to drive to town. The site are an adequate width and length. Utilities were very good. Site was rather level -- no problems with our MH leveling. The pool was just up the small hill from us but we didn't go up to look. The grounds are well kept and it has two nice ponds. There appears to be a few long term or seasonal residents but each site was extremely clean and people friendly. Its not a destination place, but an excellent choice for overnight or a few days rest. We would use this again. We camped at Natchez Trace RV Park in a Motorhome. 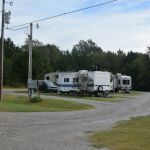 Campsites very close together....most residents look like they stay there for extended periods...pool very far away from sites.... We camped at Natchez Trace RV Park in a Motorhome. This is a very small park right off the Natchez Trace before getting into Tupelo from the south. The park has a few "tenants" but nothing to cause concern. The sites are gravel and fairly level unless you are parked on a hillside. This park is catered more to overnight campers and not for long term stays. By long term, I mean three days or more. The park is not well maintained and not much for children to do while parked there. We camped at Natchez Trace RV Park in a Motorhome. Not near any attractions other than Tupelo which is 10 miles to the north. This park is better described as camping with full hookups than as an RV park. We are not very level even with our jacks down and not enough to unhook our toad. The roads and sites are gravel with grass but there are very nice grassy areas to walk the dogs. Strong OTA TV signal. No wifi. We did not use the facilities but we seldom do. There are a couple other class A MHs in here now but we will look elsewhere if in this area again. Nice enough and clean but more for campers/trailers than large class A MHs. We camped at Natchez Trace RV Park in a Motorhome. Price is weekly rate. FHU, 50 amp, pull-through site. Roads and sites are gravel with some grass between. Picnic table at site. About 10 miles from Tupelo and Natchez Trace Visitor Center. Some trees, but we were able to get signal on our portable satellite dish. Verizon data signal slow. No wi-fi. Small pool and cabin with one washer and dryer, $1 each per load. We camped at Natchez Trace RV Park in a Fifth Wheel. The Natchez Trace Visitor Center is nearby with some exhibits and an interesting movie. Tupelo is the birthplace of Elvis and has a museum and the house he was born in. We stayed overnight and the pullthru (#4) was easy to access and accommodated us very well. It provided some lovely shade on a super hot day. There was an extra charge for sewer - either to dump or use at site so may as well ask for a full hookup. It was very peaceful and we enjoyed our respite from the road here. Lots of workers who leave early but more power to them - great to have a job! Pool was looking a little green around the edges and laundry room was a bit rustic. We didn't use either but I always appreciate an honor system laundry - so much easier than hauling around a bunch of coins. 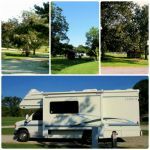 We camped at Natchez Trace RV Park in a Motorhome. We took the Natchez Trace south but found it boring and got off early. You are 7-miles south of Tupelo, birthplace of Elvis. If you are eating out go to Kermit's Outlaw Restaurant, great farm to table food. The Natchez Trace Parkway Headquarters is just up the road. A very interesting place to visit. Of course, visit the birthplace of Elvis. If you're looking for a local eatery, check out Blue Canoe. Ask for site near pavillion. It was great. Park is right off (1/4 mile) the Natchez Trace Parkway with nothing around but nature, so that was really nice. Tupelo is 6 or so miles to the north and everything you might need is there. The park is close to a couple of National Battlefields (Tupelo NB and Brices Cross Roads NB) and the Natchez Trace Parkway and Trail Visitor Center which was why we chose it. Are you affiliated with Natchez Trace RV Park ?